Reconstruction in Gaza, where heavy Israeli bombardment in a war with Islamist militants has caused widespread devastation and displaced half a million people, will cost at least $6 billion, the Palestinian deputy prime minister says. This time, Mohammed Mustafa said, Palestinians hope future donors will make good on aid pledges. In 2009, only a fraction of the nearly $5 billion in funds promised at an international conference after a three-week war between Israel and Gaza’s ruling Hamas actually arrived in the battered enclave. The West Bank-based government of Palestinian President Mahmoud Abbas has already been in touch with the US, the EU, Arab states and the World Bank to hold a donors’ summit after the guns fall silent, Mustafa said. Qatar, a major ally of the Islamist Hamas might contribute generously to a rebuilding effort. Last year, the wealthy Gulf Arab state began executing construction projects in the Gaza Strip at the cost of more than $400 million. Contacted by Reuters in Doha, a Qatari official said his country would be ready to provide money for humanitarian aid purposes, but not directly to Hamas itself. The destruction in the current conflict, now in its fourth week, is more widespread than it was in 2009. 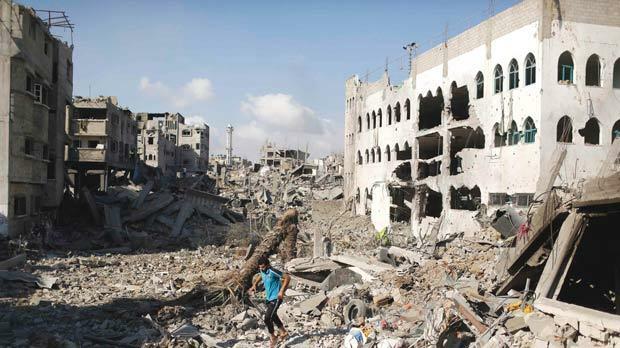 Rubble – including from homes and factories that were hit by Israeli shelling and rebuilt after the fighting five years ago – is strewn in almost every street in towns, villages and refugee camps in the densely packed, sliver-like territory of 1.8 million people. “There is a need to build 100,000 housing units,” Mustafa said, adding that a Palestinian government committee has begun assessing the damage and the $6 billion figure was only an initial estimate. Vital infrastructure must also be rebuilt. Eighty per cent of the population has had electricity for only four hours since Gaza’s only power plant was disabled by two Israeli missiles that struck fuel tanks. According to the British charity Oxfam, two-thirds of Gaza residents have been affected by damage to sewerage and water infrastructure. Israel has accused Hamas of causing such hardships by launching rockets at its cities from thickly-populated Gaza neighbourhoods and using mosques and schools as weapons depots, drawing Israeli fire. After the December 2008-January 2009 war, West governments’ designation of Hamas as a terrorist group over its refusal to recognise Israel or renounce violence, effectively blocked donor funds. And, citing concerns that Hamas would use reconstruction material to rebuild its military capabilities, Israel clamped severe limits on cement and steel imports into Gaza as part of a security blockade of the coastal enclave. Those fears, Israel now says, pointing to militants’ infiltration tunnels unearthed during the current conflict, were justified, and could complicate any international efforts to stream building material into Gaza. But the Palestinian political landscape recently changed in a way that could ease the flow of reconstruction aid, especially with Western countries voicing mounting alarm at the scale of physical ruin and civilian casualties. In April, Hamas – which seized the Gaza Strip in a brief civil war in 2007 – and Abbas’s Palestine Liberation Organisation signed a reconciliation deal that led to the formation of a unity government of technocrats. “Attracting money should be easier now through the unity government. Excuses made in the past by international donors, such as the internal division (of Palestinians), are no longer valid,” said Maher al-Tabbaa of the Gaza Chamber of Commerce. Abbas has pledged to lobby for support for post-war Gaza and has also been a critical player in ceasefire efforts brokered by the US, the UN and Egypt. Hamas has made an end to Israel’s blockade and one imposed by Egypt, which regards the Islamist group as a security risk, a pivotal demand in negotiations on a long-term ceasefire. “We demand that our house be built again. We will build it again and make it even nicer,” said Maher Al-Araeer, 45, standing in the rubble of his house in the Shejaia district in Gaza City, where 72 people were killed and hundreds of homes destroyed. Human rights groups said at least 520,000 people have been displaced by the hostilities. Many have found shelter in UN-run schools, some of which have come under Israeli attack, while others have crammed into relatives’ homes or are living on the street. When the hostilities end, temporary dwellings may have to be found for tens of thousands until their homes can be rebuilt. Whether Hamas’s popularity among Gazans will suffer over the shattering impact of the hostilities is still an open question. Its long-range rocket attacks on Israel’s heartland – most of them intercepted by the Iron Dome anti-missile system – and tunnel infiltrations that have claimed Israeli military casualties have been openly celebrated in Gaza’s streets.